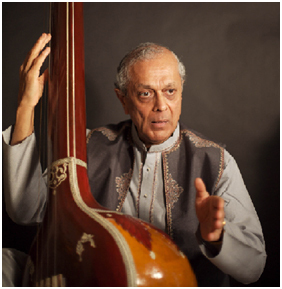 Dr. Arun Dravid, born on October 3rd, 1943, is a senior exponent of the Jaipur-Atrauli gharana. By educational qualification, he is a gold medalist from IIT, Bombay, and a Ph.D. from MIT, USA. He is currently a Vice President of a large global engineering company named Jacobs Engineering Group in California, and the Chairman Emeritus of Jacobs Engineering India. He began his early training under the tutelage of Abdul Majid Khan, a disciple of Alladiya Khan and the life-time sarangi accompanist to Kesarbai Kerkar, who built a solid foundation of the gharana’s gayaki in him. He trained under him from 1955 to 1960 and then took a small break from music for academic reasons. After a year when he chose to get back to music, he approached Mogubai Kurdikar who directed him to her illustrious daughter, Kishori Amonkar. Thus he became the first formal disciple of Kishoritai and had a long association with her. He also received invaluable guidance from Mogubai Kurdikar from time to time. Arunji’s music is a balance of the bhaava-dominant nature of his guru’s music with the structural beauty that is characteristic of the Jaipur-Atrauli gharana. The shuddha aakar and tans typical to this gharana can be observed in his music. He is perhaps the only male musician form that generation who has preserved and sings the gayaki of the Jaipur-Atrauli gharana in its pure form. Apart from raag-sangeet, he also renders light-classical genres like Thumri and Natya-Sangeet. He is also engaged in imparting his wisdom of the gharana’s gayaki to the next generation. His disciples include Devaki Pandit, Gauri Pathare, Akhil Jobanputra, among many others. Source: http://www.kshitijmusic.org/associated_artist_pandit_arun_dravid.html, https://www.thehindu.com/entertainment/music/contours-of-a-musical-journey/article23758569.ece, http://enacademic.com/dic.nsf/enwiki/6826811, https://www.swarganga.org/artist_details.php?id=321.